This is different from what you have posted above. I have ordered these connectors from a local distributor and called back repeatedly and never been able to get one of the connectors, basically because the guy is a jackass and keeps saying he ordered them, but never has. The manager at a local Circuit City said he could get these in a few days special order, but my Metra connectors had already arrived by the time I found this out. The connector that plugs into the car harness is a Turbowire 70-7903 - I paid $7.29 for these. The connector that plugs into the head unit is a Turbowire 71-7903 - I paid $10.85 for these. These are supposed to be available (special order, of course) from Best Buy and Circuit City according to Metra sales. I got the name of the local distributor from Metra in Holly Hill. I ordered several of each gender so I enough pins to make a jumper harness between my head unit and Bose factory stereo, and tapped off BATT, ACC, and GRND from the harness for my Moto IHF1000 bluetooth handsfree adapter. I also added a pin for the MUTE function (pin L) going to the head unit (pin L). In addition I tapped off the PULSED DIMMER TNS+ and and INVERTED DIMMING signals to get some of the lighting for my add-ons to follow the instrument panel dimming. BTW, 'PULSED DIMMER TNS+' (pin e) is somewhat of a misnomeras it is not pulsed at all. It is a line that switches to +12v when the light switch is either in PARK or HEADLIGHT position. When lights are switched off it is at 0V. It provides a +12v signal to indicate that some exterior lighting is on. 'INVERTED DIMMING' (pin g) is 0V when the panel dimmer is in the detent position. When it is switched out of detent and advanced a bit, a narrow 12v pulse starts at a period of approximately 5mSec (minimum dimming), and as the dimmer is advanced, the pulse gets wider until it is at 12v for 4.2mSec and at 0v for 0.8mSec out of the 5mSec for maximum dimming. This signal provides a varying pulsewidth Ov signal to the negative side of the panel lights. Almost all of the info I initially got was from Stephen Fosketts' Miata website (many thanks Stephen, you saved me many hours of reverse-engineering time!!! ), where J-01 has a pinout for a 2004 RX8 which is accurate for my 2005 model also, with the exception of some wires not in the harness because I don't have the navigation unit i.e. NAV: PARKING BRAKE pin k, NAV: REVERSE pin m, and a black/white wire at pin t. Strangely, there is a wire at pin h POWER ANT. This wire presumably signals when the radio is turned on, and could probably be used as a trigger to turn on an aftermarket amplifier. Last edited by Shinka in MD; 11-23-2005 at 05:04 PM. Thanks, they added "B" to indicate "bag" from what I remember. I did wrongly list MA03B as the reverse harness, whereas I should've listed MA03RB. Info update, thanks for your info! I have also linked to your post for other information. is there ne replacement strereo faceplate adapters out for the rx.if so please let me know. Just wanted to thank everyone for this great thread. I haven't been posting since I don't have an 8 YET and don't want to seem like a poser. I do however like to do my research before buying. I was very disapointed in the 8's audio/visual potential until I have read every last thread & post on this web site. I will be joining the ranks soon! Peace!! Strangely, there is a wire at pin h POWER ANT. This wire presumably signals when the radio is turned on, and could probably be used as a trigger to turn on an aftermarket amplifier. Wow, nice information Shinka. However, I wouldn't use the power antenna lead to trigger an amp. Typically, this is only "on" when you're using the radio. If you switch to CD (or any other input), there's no voltage on this line, and your amp will shut off. 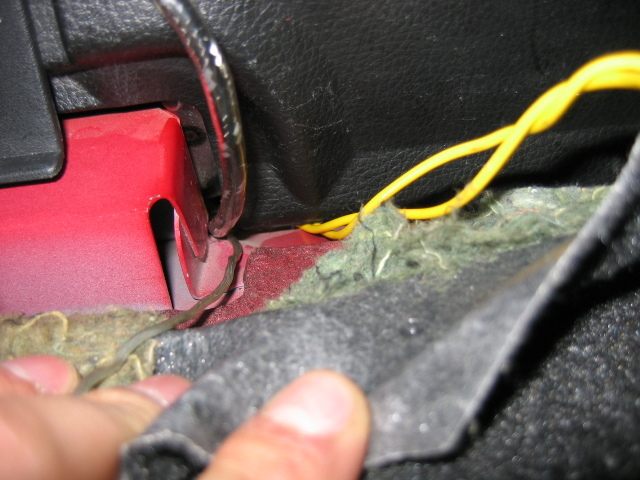 Right now, AFAIK, the only options for aftermarket HUs and keeping your A/C controls and display are to keep the stock HU in the car (at least portions of it) and make sure that the proper wiring still goes to those controls after the aftermarket HU is installed. In my case, you can go to this thread to see how I did my install. The wiring runs through the center console back to the A/C controls and LED readout. Eight months now and no problems with it. Devoid installed the same deck as I did, but they did something a little different with his stock HU. You'd have to ask him. When they relocated the stock HU and installed the aftermarket HU did they just splice into the existing wires or did they use one of the harnesses mentioned? Both HUs output differential speaker-level signals. Do not hook the HU signal directly to an amp's line-level RCA inputs. Instead, connect to a line output converter first or ensure that amp has speaker-level inputs. Otherwise, frying of HU may occur. I'm the one of those who has been stressing that the signal between the Bose HU and Bose amp is speaker-level differential very similar the Non-Bose HU. Well, as of this weekend, I finally got a chance to install the Soundgate at the HU and I have to say it works great - noise-free and clean. So you don't need to and probably shouldn't tap the signals after the Bose amp (with the wild EQ curve it applies). Tap the signal before the amp and use your speaker-level inputs on your amp or the Soundgate LOC. This also means my install is finally complete and I should have a write-up with pics shortly. Last edited by MrWigggles; 03-13-2006 at 02:19 AM. I just hacked away =). The cables are too short anyways... ill take pics this weekend if you would like. Just PM me to remind me. My question to those in the know for now is, can I just replace the bose speakers with regular old 4ohm speakers and not cook anything in the head unit? I have a basic understanding of how this stuff is supposed to work, but I'm still not totally sure. Eventually I want to do an amp, and will probably put in a sub soon (both using line level converters as mentioned several times) but can I just replace the speakers for now? Or will the lower power output because of the higher impedence make the difference negligible. All you need is a convertor. You can get one at any audio store. I got mine at Circuit City. 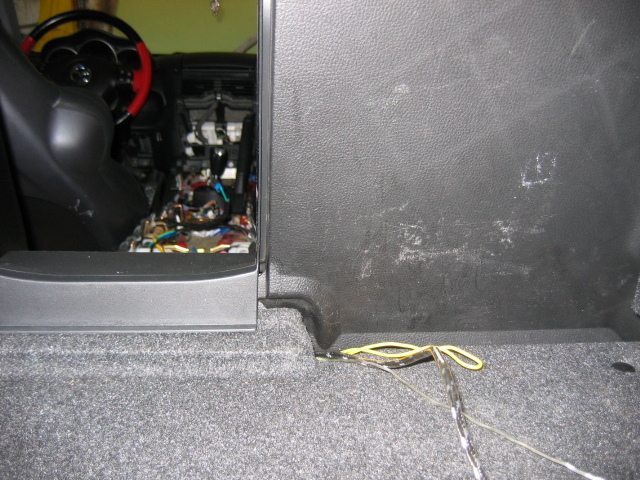 I took out the interior center console myself and was only charged about 30 bucks for them to hook up all teh wiring. But you can even do the wiring yourself. I ran the wiring down the center console. I just hope that the heat wont be a factor. 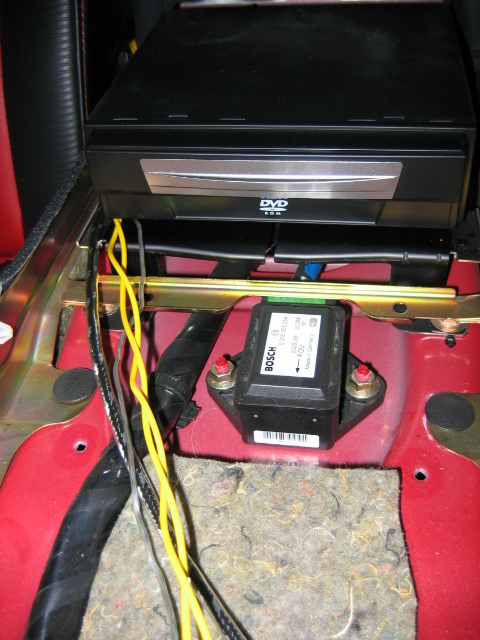 I also hooked up an additional power wire to the 12V by the ash tray for a LED set up in the trunk. Last edited by redmaz8; 06-04-2006 at 06:10 PM. Great thread! If anybody knows the power output of the head unit that'd be a good thing to add to the first msg. I noticed that the head unit harness (stock unit) only has wires for the front and rear speakers. Does anyone know how the tweeters are connected? Are they wired elsewhere in parallel with the front speakers? quick question: I noticed the front bose tweeters are 2" but seems like lots of people are replacing with 1" Infinity Kappas? Does that sound right? Also: how hard is it to get that 4" to fit in the center? Should I just get the 3" infinity? Last edited by Jedi54; 09-10-2006 at 03:54 AM. Howzit....anybody got pics of their installs?? seems like a line output converter is not needed for the base radio if you have speaker level inputs on your amplifier. The summary at the beginning of this thread says you need one, so there should be another option there. Also the mention of using lexan (or whatever) to make 6x8 -> 6.5 speaker adapter plates can be avoided by purchasing a pair of Scosche SA68 brackets for only $8 (+ shipping). I have not actually bought these yet- I figured I would suggest it and see if anyone knows for sure that they fit. A link to the www.whatsmyip.org/ipodrx8 should be noted in the first post. Hey, I don't have much time these days, if someone could PM me the set of links to the different AUX/Ipod integration options like firebirdude describes, I will gladly paste that into the sticky. 1)StealthTL says there is a large grommit next to the washer fluid and advises to use this. Seems like it would be best of both worlds. Short and no drilling required. EDIT: Just tried to use this path for my own install. While I was able to squeeze a coat hanger through there, no way in hell was 4awg power wire fitting through there. I used the bottom passenger side tube as my guide. If you dig your fingers in there, you can feel the opening through the firewall. No way. If you're reading this StealthTL, which of the 4 pipes did you squeeze along side? EDIT: Stealth just PMed me back. He was able to get 8awg through there. So this is an option for those using 8awg. 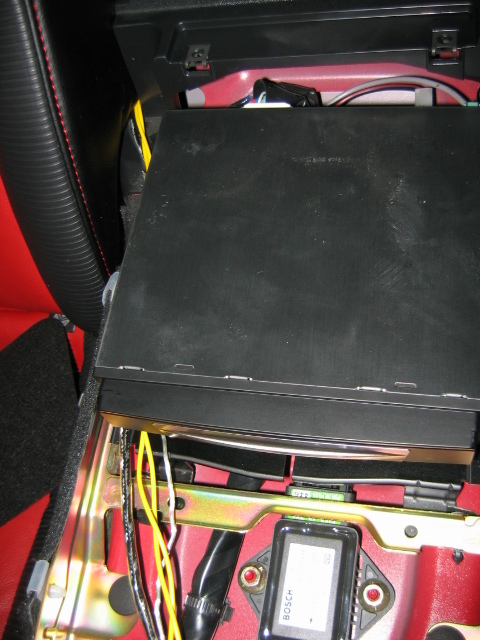 2)Supra0083 notes that people with a Bose system can use an acc lead right off the bose amp. No need to tap into the seat heater controls. EDIT: I've just searched for this wire and I have no such thing on my Bose harness. Measuring with my DMM at the Bose harness, I noted that the yellow/white and pink/black wires are hot only when the key is in the acc mode. Makes no difference if the headunit is on or not. Anybody know what exactly these two wires are for? Both of these, if indeed are true, should be noted in the first post of this thread. They are both superior ways of doing an install in the 8. Last edited by firebirdude; 05-18-2007 at 10:32 AM. Astral, can you add to the 1st post the corksport link http://corksport.com/store/category/...-interior.html and this one http://www.kanack.co.jp/english/TBXE/tbxe_t003.html which can be bought from japanparts (I think they are the same part but anyway). OK, added! thanks for the tip! Would it be possible to get the pinouts for the other harnesses behind the radio? An installer friend and I are trying to devise a cheaper "magic box" so we can lynch the radio and still have a/c w/o having to keep the boards connected or whatever. I've looked all over for this with no luck, anyone have any ideas? I hate to buy an entire wiring book just to get one small piece of the puzzle. OK just got HyperRev 110 and found the following. canaryrx8 if your japanese is good the feast kits have some details about doing that. Measuring with my DMM at the Bose harness, I noted that the yellow/white and pink/black wires are hot only when the key is in the acc mode. Makes no difference if the headunit is on or not. Anybody know what exactly these two wires are for? ???? So people don't continue to tap into the rear cig lighter...????? And again, really believe http://www.whatsmyip.org/ipodrx8/ should be included in first post. Perfect walkthrough on headunit removal.